At the end of October, it was quite the roller coaster of freezing one day to low 50’s the next. I had been wanting to make soup for weeks. Once I finally had a place I could call my apartment, I got to cooking. the thing was, I still don’t have any of my kitchen stuff except my blender, so I need something that wasn’t too involved, that I could make with what my roommate has for kitchen stuff. I went through my recipes and found this one for Sweet Potato Tortilla Soup that looked pretty easy and sounded delicious. I was kind of silly with my order, even though I read the directions through before starting, I did things in a funny order. I forgot or skipped over how long the soup would simmer (40ish minutes) and started the chicken and tortilla strips while working on the soup base. Unnecessary. Start your base, get it simmering, then worry about the chicken and the chips. I completely forgot about the cilantro, even though I bought it. I am not the biggest fan of it anyway, and left it out each time I warmed up the leftovers. I forgot about the lime in all the leftovers. I didn’t notices any difference… I love the tortilla strips. I may never by a bag of chips again. I made them fresh each time I had a bowl of leftovers. If you don’t feel like making them, you can substitute those from a bag, but they are worth it. Also, this is pretty spicy for those who don’t do spice, so beware. I loved it. But you may want to omit the chili if you don’t do spicy, maybe substitute something milder. In a small, dry skillet (not nonstick), toast allspice, cumin and peppercorns over medium heat, shaking occasionally, until fragrant. Watch this, you don’t want to burn them. Add the toasted spices to a blender with onion, garlic, chipotles, adobo, 2 teaspoons salt and 1 cup chicken broth. Blend on high power until completely smooth. In a large pot, combine the purée, the rest of the broth and the diced sweet potato. Bring to a simmer, then cover and let simmer for 45 minutes until the sweet potato is tender. Preheat the oven to 375. Slice the tortillas into strips, then spread out on a foil-lined baking sheet. Toss with the tiniest bit of olive oil and a generous sprinkle of salt. Bake for 10 minutes, tossing occasionally, until golden brown and crispy. Set aside. Heat a bit of olive oil in a skillet on medium high heat. Add the chicken and cook until completely cooked through, about 7 to 10 minutes. Set aside. Once the potatoes are soft, add chicken, black beans and corn to the pot, and let simmer for a couple minutes just to heat through. Check for seasoning and add more salt if necessary. 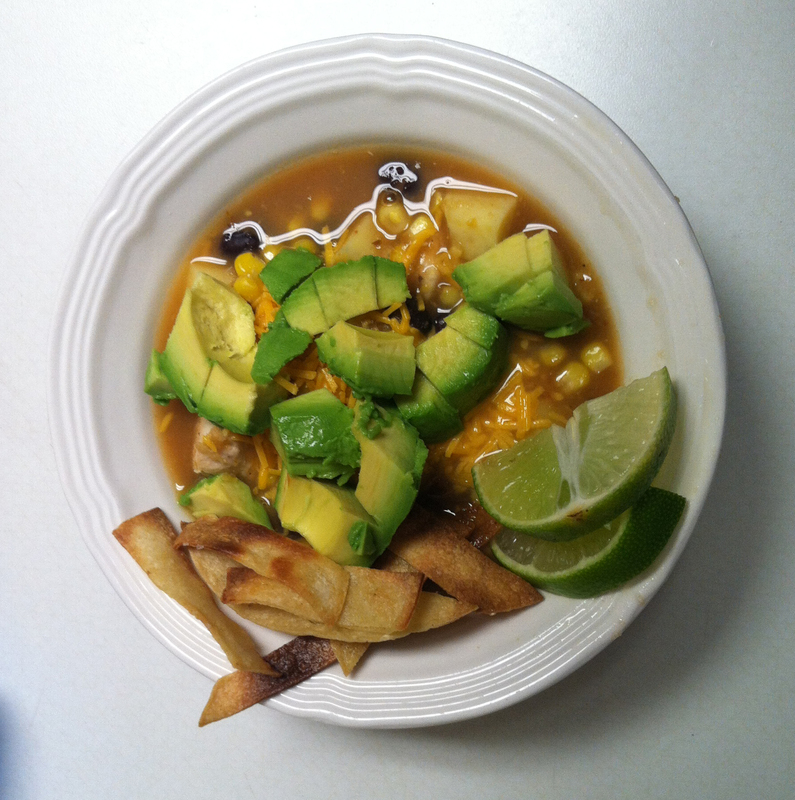 Divide soup among bowls, and top with sliced avocado, lime wedges, a sprinkle of shredded cheddar and tortilla strips. 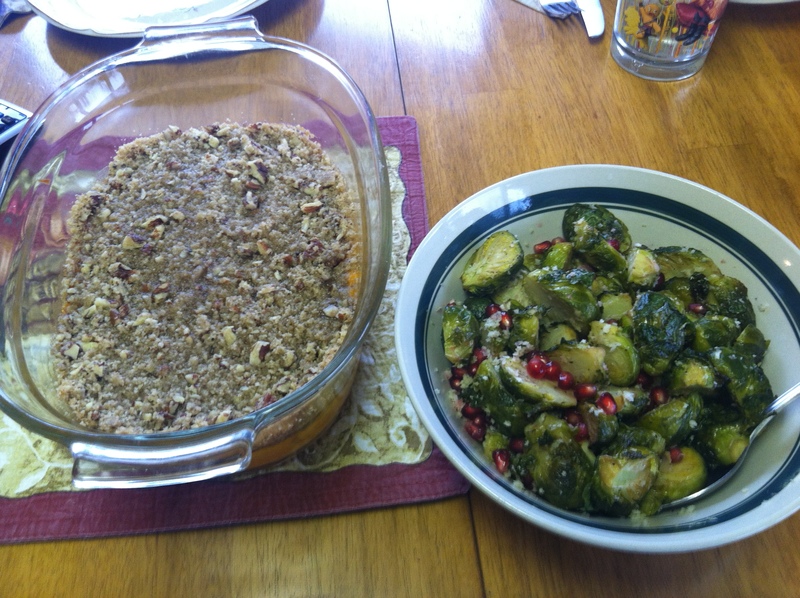 This entry was posted in Recipe Box, Soups & Starters and tagged Chili, sweet potato on November 12, 2013 by perishableitem. Have I mentioned that I love grilling? Cause I do. I have been trying mix up my sides this summer. I’ve been experimenting with more vegetables on the grill and for the most part it has been pretty successful. My most recent experiment involved sweet potatoes based on a recipe in Great Food Fast. Have I mentioned I love sweet potatoes? Cause I do. Two of the greatest things in the food world put together. Bliss. The recipe is super simple and quick. Try to make the slices of potato as evenly as possible so they cook at the same speed. Another tasty side that I made this weekend was corn on the cob grilled. I had somewhat forgotten about it, but flipped by the recipe while looking for the sweet potato one and figured they would be perfect together. Also super simple and quick and pretty much impossible to screw up! Put these together with a great cheeseburger and you have a perfect Sunday night. Heat the grill to medium. In a large bowl toss all the ingredients together. Grill for 20 to 30 minutes, or until they are tender when pierced with a fork. Turn frequently. Doesn’t it all just look so good?!? Peel back the corn husks (do not remove) and remove the silk. Soak in cold water for 10 minutes. Remove the corn from the water and pull the husks back over the corn. Lightly oil the grill and grill the ears for about 15 minutes or until the kernels are tender, turning frequently. Allow the corn to cool for a minute before using dish towel to remove the husks. Serve. This entry was posted in Recipe Box, Side Dishes and tagged corn, grilling, sweet potato on August 11, 2011 by perishableitem. Before one of my first New York friends moved to Portland, She gave me her recipes to go through and I copied a lot of them. Sweet Potato Ravioli with Lemon Sage Brown Butter was one I copied, so I have had it for a few years now and I guess I never made it because I thought it would take a long time or looked difficult. Since Sweet potatoes are my new love, and this makes 8 servings I thought it would be another good recipe to make at home. It was a much bigger hit with the family than the Risotto, although my little sister still refused to try them since they had sweet potato. They had much more flavor according to my mom and I would have to agree with her, but I still love the risotto. We stuck to the recipe pretty closely except we didn’t use fresh lemon juice and used dried sage. We may have also had too much sweet potato, or put too little in wrappers, but we ended up with about 40 raviolis. To make the 16 year old baby happy we made her some perogies with leftover Christmas mashed potatoes mixed shredded cheddar and the extra wanton wrappers without any butter sauce. These were also really tasty and fast. Just mix up the potatoes and the cheese and place them in the wrapper the same way as the ravioli and cook the same. One can be less picky than my sister and add a sauce to it. Melt butter in a small skillet over high heat. Add chopped sage to pan; cook 1 minute or until butter is lightly browned. Stir in remaining 1/4 teaspoon salt, juice, and pepper. Drizzle butter mixture over ravioli. We had to wait a bit for my dad and brother to get home for dinner and so the ravioli stuck together even with all the cooking spray. We ended up more of a casserole than individual raviolis. This entry was posted in Main Dishes, Recipe Box and tagged butter, ravioli, sage, sweet potato on December 27, 2010 by perishableitem. Since I am home in my mom’s large, counter spacious kitchen and four to six people have to be feed each day, I am taking full advantage. I brought home recipes that seemed like too much work to half or make for one or won’t keep forever as leftovers. Last night I decided to make a Chicken Braid, an old favorite that I haven’t had in years. The first time I had it was at my friends house and his mom gave me the recipe which I brought home and made with my mom a few times, but it has been hiding in my recipe files for awhile. I have to admit that when it was time to start dinner last night I was sent over to my grandparents to drop off some of the candy and cookies we made yesterday and mom ended up starting and finishing the chicken braid before I returned through the trees. Never the less, here is the tasty recipe. Mix Chicken, broccoli, and pepper in bowl. Add mayo, dill, salt and pepper to chicken mixture and blend well. Unroll 1 package of crescent rolls and DO NOT separate. Arrange longest sides of dough across wide baking stone. Repeat with the second package. On long side cut dough 1 1/2″ apart and 3″ deep (leave 6″ in the center to fill). Spread mix over center of dough. Pick up strips and twist over mix. Brush egg whites over dough top and sprinkle with almonds. Bake 25 to 28 minutes or until deep golden brown. Tonight I made a new recipe I found in Real Simple, Sweet Potato Risotto. I made it once before and thought that my family might like it, even my picky little sister (she is much worse than I am or ever was). It’s not hard, it just take some time to chop everything and it takes about 45 minutes to cook. I followed my friend Melissa’s advice and measured ever thing out in advance since it starts out rather quick and there is not a lot of time to do so when your in the middle of cooking. Heat the oil in a large saucepan over medium heat. Add the onion, ½ teaspoon salt, and ¼ teaspoon pepper. Cook, stirring occasionally, until soft, 3 to 5 minutes. Add the sweet potatoes and garlic and cook, stirring occasionally, for 1 minute. Measure 3½ cups of water. Add ¾ cup at a time and cook, stirring occasionally and waiting until each addition is absorbed before adding the next. It should take 25 to 30 minutes for all the water to be absorbed. My sister did eat it, but she refused to try the sweet potatoes and picked them out. She claims she would have picked out the onion, but that was too hard. I think she would have liked the potatoes if she would have tried, I may be picky, but at least I try things. She also mixed in French Dressing. I don’t know how that made it better and given her picky eating I can’t believe that she would mix them together. I think its fine the way it is and it’s great as a leftover. This entry was posted in Main Dishes, Recipe Box and tagged broccoli, chicken, cresent rolls, peppers, risotto, sweet potato on December 21, 2010 by perishableitem. So two weekends ago I was going through my recipes and picked out Loaded Potato Soup as something to make that weekend, but I didn’t get around to making it until this Saturday. I haven’t had potato soup since I was in middle school (maybe high school?) at my best friends house. I remember it was delicious with carrots and celery and ever since then I have meant to make it again and probably have three or four recipes. This version is a take on the Load Potato Skins, another one of my favorite ways to have potatoes. I may have been short a piece of bacon and had a shallot to use instead of an onion and of course I was using whole milk. I think that have the extra bacon and onion would have made it a bit more flavorful, but it was still good and it will stay good in the fridge of a few days. I used just paprika and salt for the seasoning and baked them for a lot longer cause I was trying to get them crispy, which I failed at but they were still very tasty and completed my very potato dinner. Does anyone have any ideas how to get them crispy? This entry was posted in Recipe Box, Side Dishes, Soups & Starters and tagged fries, potato, soup, sweet potato on November 15, 2010 by perishableitem.